Any desired bagel toppings such as poppy seeds, sesame seeds, etc. 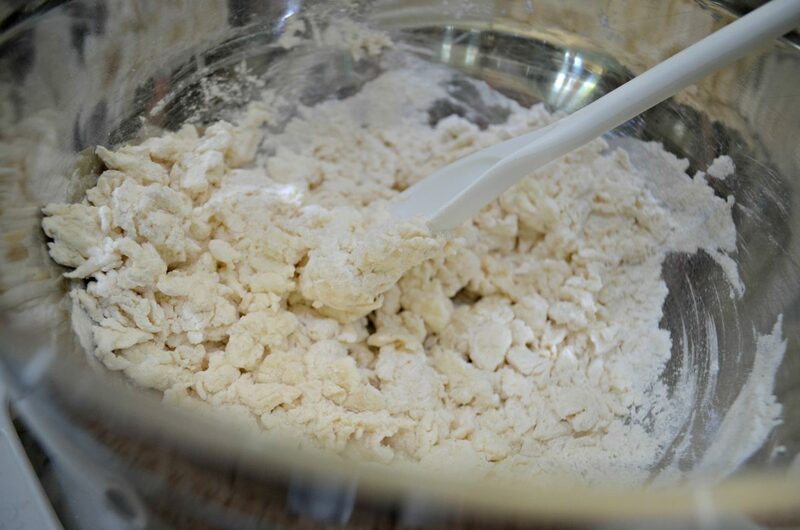 Mix flour and yogurt in a mixing bowl. Combine into a tacky dough. Sprinkle flour onto a cutting board and roll dough into a ball. 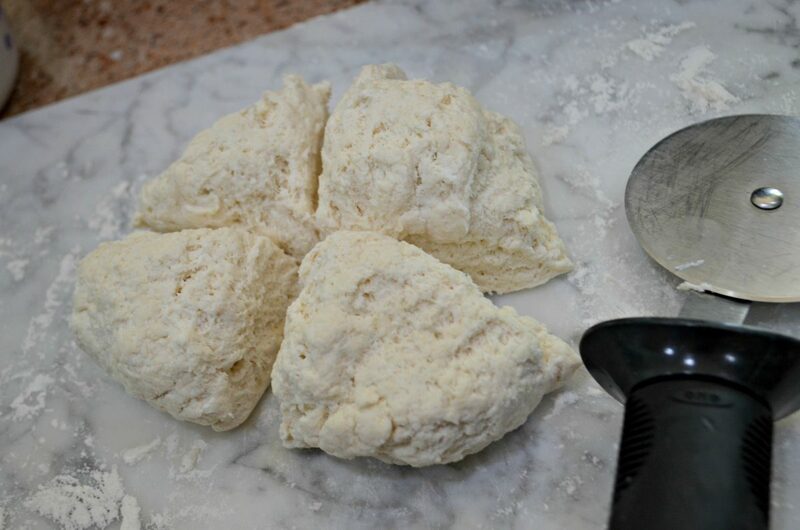 Cut dough ball into fourths. 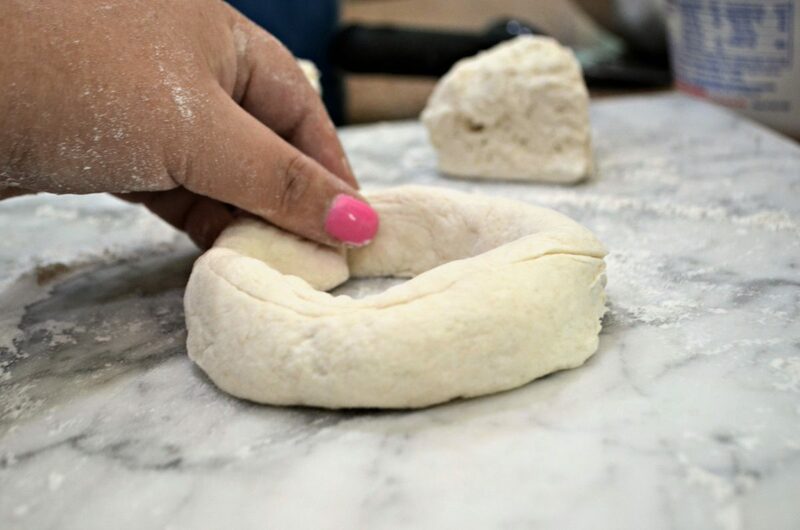 Using your hand, roll each dough ball into a bagel shape and pinch edges together. Place two at a time in a greased air fryer basket. Brush the tops of bagels with an egg wash (optional). Set the timer and cook for 10 minutes at 330 degrees Fahrenheit. Remove from air fryer. Brush with a melted butter (optional) and season as desired. 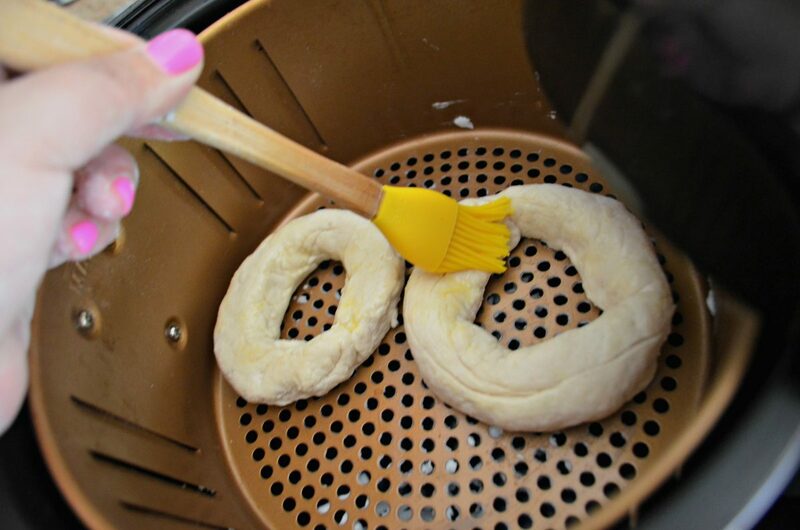 Want “from scratch” bagels in just 10 minutes? 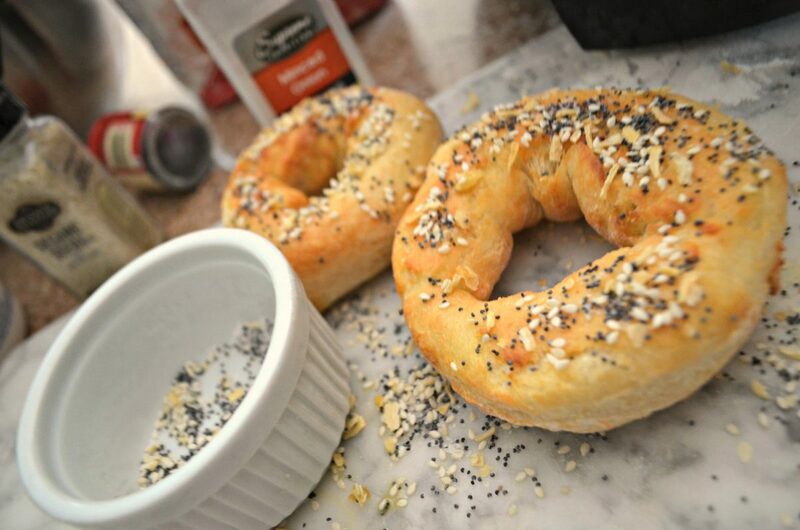 Try creating delicious, chewy homemade 2 ingredient air fryer bagels with only Greek yogurt and self-rising flour as the main ingredients. For real! 😮 Plus, they only take ten minutes cook time using the air fryer! Just add your desired toppings and they’re ready to eat. As you know, I’m obsessed with my air fryer and have been testing out all kinds of recipe ideas to share with you all. I’m happy to report that this clever 2 ingredient bagel idea is a definite winner! You can serve as is or make a yummy bagel sandwich! Hip Tip: Make sure to use zero fat Greek plain yogurt, and if there’s liquid on top, drain it first. 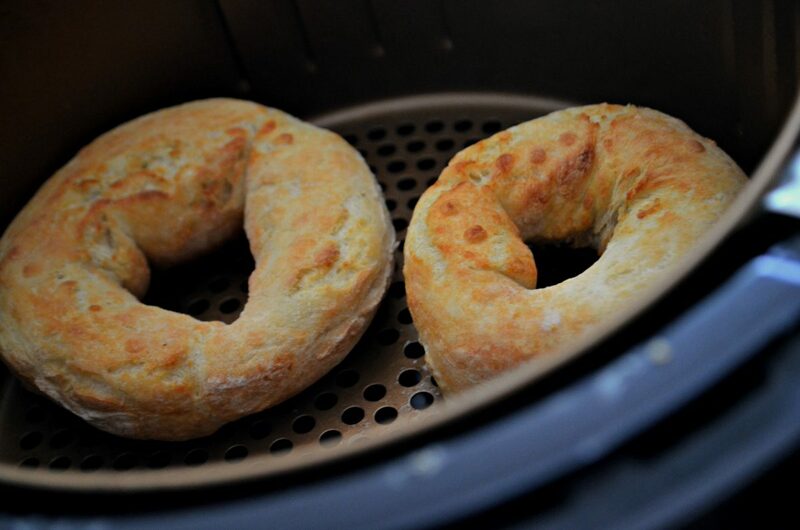 There are only 2 main ingredients in these delicious air fryer bagels! You can also bake these in a traditional oven; however, the cook time will be closer to 20-25 minutes. These 2 ingredient air fryer bagels taste AMAZING! For only a couple main ingredients and very little cooking time, this is a definite must try recipe! I love that there’s no yeast required, no boiling, and the dough comes together easily. I do, too! Ideally, my favorite is Everything Bagel Seasoning like Trader Joe’s carries! I didn’t have that on hand, so I combined poppy seeds, sesame seeds, garlic flakes, onion flakes, and salt to make my own. It’s so good! It’s also worth mentioning that this is a Weight Watchers idea and is said to be 3 smart points per bagel. Consider using this simple dough in other ways too, like breadsticks, pizza, calzones, etc! Lina! Thanks for another wonderful idea! I always look forward to seeing your creative ideas, so motivational! Hey Lina, thanks for the grt ideas! I just made 5min donuts and they came out so good and were so so yummy. My kids just loved it. Will definitely try these bagels too. Yay! I think you’ll love this! Do you have the recipe for the donuts ? ok sooo trying this . I’ve had my fryer over a year and haven’t really made anything from scratch or fresh except to cook frozen foods. Trader Joe’s makes an amazing product called “Everything but the Bagel” sesame seasoning blend. It is a MUST, if you make homemade bagels and breads! Yes! I want to try it! Walmart has their own brand of everything bagel seasoning also! where can we find all your air fryer recipes? I just bought one and am excited to try it out. Thank you! These look so yummy. Has anyone tried making these with a gluten free flour? Yikes, these look awful. This is an insult to bagels. LOL, I am a NYer and therefore a bagel snob. I was wondering how good could these bagels really be? Opie, I wouldn’t put them down until you taste them. I think the idea of making them fresh at home in the air fryer is really cool. If u knew something about baking science u would know that yogurt + self rising flour has all the ingredients u need to bake bread…or in this case, bagels. On the other hand, it’s not a bagel without NY water! It says they can be baked in a regular oven at the twice the time. An air fryer is small table top convection oven. So if you bake them in a regular convection oven instead, the time should be the same. Great! Thanks for sharing Amie! Thank u so much. How about whole-wheat bagels? Trying to eat healthier. Is that possible with an air fryer? I will def try this in my as-of-yet unopened air fryer box! I know that yogurt and sour cream can be exchanged for each other in certain recipes. Would this be one, or is there something different about Greek yogurt where sour cream wouldn’t work in this instance? I don’t believe you can substitute sour cream in this instance. If you use a regular oven what temperature do you use? Could I use regular flavored yogurt? No, it would make the dough too runny. Greek yogurt is thicker. I would strain it using cheesecloth 1st…bascally a diy greek yogurt. Want to try this. Sounds delicious but do you happen to know what the carbs would be? I don’t know – but if your flour shows how much is in one cup, and your yogurt shows the content of 8oz, just add them and divide by 4. It should be close. Thanks Lina! Love your posts. Do you know if I can substitute the AP flour for almond flour? I’ve heard it comes out sticky —however, I’ve heard you could add a teaspoon of gluten free baking powder to the basic fathead keto dough, which is cream cheese, mozz cheese, egg, and almond flour…and it should rise. I’m going to try it soon! <3 Hope that helps! Could I use almond or coconut flour to make these low carb? I do something similar but cut the flour in half and use protein powder for the remaining half. I love two ingredient dough. I use it for my pizza dough, pretzels and have made cinnamon rolls. I guess I’m gonna have to breakdown and order an air fryer, these look so yummy! Macy’s has an air fryer on sale for $39.99, which is lowest I have seen. These are so good and so easy! I’ve only made in the oven, but got an air fryer yesterday and I cannot wait to make them in the air fryer! I see a fried egg bagelwich in my future! Sorry if I missed it, buy nutrition facts? Carb count? I made these today using the self rising flour substitute and 2% Greek yogurt. They turned out like biscuits, not bagels. Tasty, but not bagels. So when you say a cup of yogurt, do you mean 8 oz, or just the single 5.3 oz standard yogurt cup?That might be my problem. Agreed.. when providing recipes for preparing anything, you should use detailed instructions. I have cups of every size shape and color. Should I use my opaque purple cup or my yellow dinosaur cup?? Just made these and they were perfect! Highly recommend! When you say 1 cup of yogurt, do you mean one typical packaged cup of yogurt (6 oz) or 1 measuring cup? I would like to by an air flyer but not sure which one to buy. In Canada I do not have much choice to pick from. I have a tfal one but cannot do to much with it. It wasn’t that I didn’t believe this would work, wasn’t sure I could make it work! They were easy, great pictures to follow (thank u for that), BUT REALLY GOOD!!!!!! For one person perfect think I will leave them in a minute or two longer next time so the inside is a little more done. I love my air fryer, cook mostly from scratch except fries, I have a smaller one perfect for one or two. Love your sight thanks for your hard work and making cooking fun!!!!! I am struggling with the dough. Very sticky and hard to handle. I add a little additional flour but that doesn’t help. I know many use Fage yogurt and I am using Oikos. Appreciate any tips. Thank you. Ya it is a sticky dough in general. Making sure to flour your hands and the cutting board you’re working on is helpful. We love our bagels and I’ve made two batches now which turned out so good I’m shocked. Ive been telling friends and it’s “well I like Montreal bagels” or “i like NY bagels”. For heavens sake use a cup of flour and try them. I used 2% yogurt the first time and whole yogurt the second. Both worked. Would it be possible to add asiago cheese to the batter and have them turn out? And of course, tons on top!! I agree. They are interesting but they do not taste like bagels. Keep trying. These are delish and SUPER easy!!!! Thank you for sharing. I followed the directions and made the bagels today. They looked beautiful and smelled heavenly however, they were raw inside. Has anyone else had this issue?? Yes. I had to add more. The dough was also super sticky. They were more like biscuits. I just made these bagels. 2 I worked the everything but the bagel seasoning into the dough and the other 2 I added 1/3 cup shredded taco cheese that I worked into the dough. I had to bake them 5 minutes longer and I didn’t stretch them out big enough because the hole in the middle almost filled in. I ate the cheese bagel for dinner and it was amazing! Glad I put all the goodies inside so I didn’t loose any to the toaster or floor! A lot of people on weight watchers make these, they also use the same recipe for pizza dough and biscuits!!! Can you make this with almond flour? I am trying to lose weight and don’t want to eat flour? Have you tried it with any other flour? Last week I picked up a container of Spice Supreme “Everything Bagel Mix” in the spices section at Dollar Tree. Did not have a specific use in mind at the time. Just figured $1 wasn’t a bad price. Just received an Air Fryer today that I had ordered last weekend. All I need is the Yogurt and I will be set to give this recipe a try. Just a heads up to anyone interested in the spice mix. The Everything Bagel Mix is a spice blend shake on type seasoning sold in a shaker jar. It is sold along side the regular spices…garlic powder, italian seasoning, onion powder, etc…. It has the type seasoning and seeds seen on anytime italian loaf bread like what Walmart sells. I haven’t noticed the spice at all Dollar Trees. Recommendations on air fryers please? So many brands and features! I have a nuwave and power xl. Love them both! I apologize if someone has already asked this, but do you know a keto friendly version for the air fryer? Thanks in advance. Oh my goodness thank you Lina!! I love my air fryer (thank you H2S) who introduced the airfyer world to me, you’re great enablers, lol!!! I use mine all the time for Salmon (it’s amazing!! ), Shrimp, asparagus (amazing too) diced potatoes, fried chicken, zucchini, and that’s all I can think of at the moment! But I’ve never tried donuts or bagels – I’m so excited to try them! Thank you Lina for posting your amazing recipes! Oh I’m so happy Barb! Wow you’re an air frying pro now! ❤️👏 Thanks for the sweet comment. I made these yesterday for my daughters. Today I made 4 more batches. My girls love them! I made blueberry, cinnamon sugar, everything, and plain. They are amazing. I wish I could post pictures here. Oh my goodness how awesome! Thanks for sharing Graviey! Be careful if you don’t have a nonstick air fryer basket. They stuck terribly. Also, the dough is super sticky and not smooth at all. Your photos look like you used two separate batches of dough for the pictures. They were tasty but more like a biscuit than a bagel. Next time, I’m going to try mixing in my stand mixer to get a smoother consistency.